Hi, my name is Danielle, I’m in my 40s (shhhhh! ), a mom to a crazy but cute five year old and I can’t stop singing songs from the Descendants 2 soundtrack. All joking aside, I really do love the music from Disney’s new Descendants 2 soundtrack. And the choreography. And the movie! I remember when the first movie came out I was slightly intrigued by the concept of the daughters and sons of our favorite Disney heroes and villains attending school in Auradon. I really enjoyed the first one, didn’t love it, was a bit disappointed by the villains, thought they were portrayed as campy and silly, but the movie did teach my kid how to spell ridiculous at a young age! Fast forward to Descendants 2, of course my little princess was excited about this movie, she loves Mal and Evie! The movie focuses on Mal, daughter of Maleficent, who is now King Ben’s (song of Belle and the Beast) first lady. But all is not what it seems in this fairy tale. Mal’s drawn to her evil side because she feels like she doesn’t belong in the fairy tale world of Auradon and decides to high tail it out of there back to the evil world of Isle of the Lost. Back on the evil isle are some new characters, including Uma, daughter of Ursula, Harry, son of Captain Hook and Gil, son of Gaston. Uma, jealous of Mal, wants everything she has and is not afraid to tell anyone. The story goes into Mal’s little circle of Evie, Jay and Carlos joined by Lonnie, Mulan’s daughter, and King Ben, to go to the Isle of the Lost to bring her back. A fight ensures, swords are drawn and some sweet dance moves are shown. I won’t give too much away but I’ll say my daughter has been watching this almost daily and listening to the soundtrack exclusively. She is a huge fan of Uma (that girl can sing!). The movie is really great overall. We really loved it in this house. Some of our favorite songs and dances were Ways to be Wicked (now my kid can spell wicked), Chillin’ like a Villian, What’s my name (Uma’s theme song and my kid’s favorite) and It’s going down (my favorite). The choreography is fantastically choreographed by Kenny Ortega (hello High School Musical!). My only criticism is lack of villains. We didn’t get to see any from the first movie and it would have been nice to see Ursula (we see a tentacle), Hook, Gaston and Cinderella’s evil stepmom (who we hear off camera). The movie ended with a teaser for another one and with this much success and love, I’m sure there will be a third one! Can’t wait! 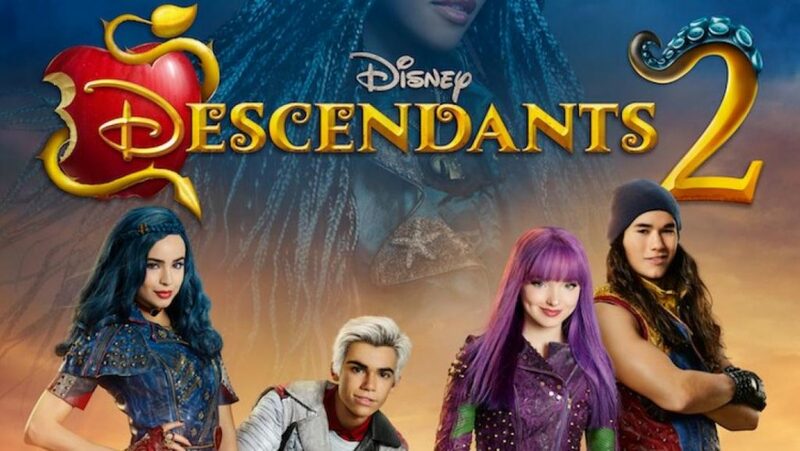 Disclaimer: We received a complimentary copy of Descendants 2 in exchange for an honest review. No other compensation was received. Opinions expressed are our own. Affiliate links have been provided. Previous PostCustom-made T-shirts by Jilly Shack! Next PostDVD Review: "Mickey and The Roadster Racers: Start Your Engines"